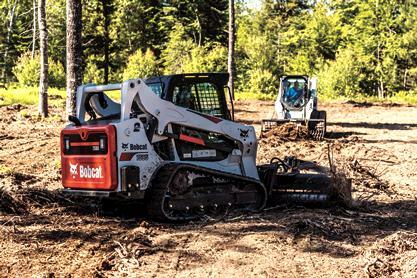 With a larger displacement motor, direct drive, fully-welded frame and simple maintenance, Bobcat soil conditioners are built tougher. Compare the Bobcat design and quality with other soil conditioners. Other soil conditioners have design flaws that slow you down on the job. With convenient controls, automatic depth control, oscillating front wheels and other features, Bobcat soil conditioners save time and let you tackle tougher landscapes. See the difference in this side-by-side comparison. Manual Angle and Depth Control: Drum rotation is accomplished with a hydraulic motor, while angle and depth control changes are adjusted manually. Angle control can be set between 0 and 25 degrees to the left or right. Depth control is adjusted with a turnbuckle system. Available on 48- and 72-in. models. On-The-Fly Adjustments: Hydraulic cylinders allow the operator to make adjustments on-the-fly using finger-tip controls from the comfort of the cab. Angle control can be used to direct spoil. Depth control can be used to quickly shave off high spots and fill in low spots. Available on 72-, and 84-in. models. Tough Soils: For ripping though the toughest hardpan and richest clay soils, harness the additional horsepower of high-flow hydraulics, which provide tremendous torque to the drum. Increased drum torque creates a true powered box blade, delivering a smooth jobsite with fewer passes. Available on 72 and 84-in. models. Carbide-tipped teeth on the drum easily rip through hardpan and pulverize clumps. Clumps are ground up, and rocks and other debris are windrowed to the edge of the jobsite. A rubber flap above the drum keeps larger material from going over the drum while allowing fine materials through for a smooth finish. The drum rotates in either direction to allow working in forward or reverse. Box blade end wings are standard to help move large amounts of material and fill in low spots. Remove the end wings to allow for even distribution of material. An oscillating booster is standard on larger models. Oscillation keeps the drum parallel to the ground and helps minimize the effect of bumps and potholes, resulting in a smoother finish in fewer passes. The oscillating bolster combined with hydraulic depth and angle controls also make it easy to cut swales for drainage and to sculpt the land. On larger models, another standard feature is the ability to lock the drum or allow it to float. In the locked position, the soil conditioner acts much like a box blade and will level the surface. In the float position, the drum is able to float over the terrain, preparing the soil without leveling sculpted land.